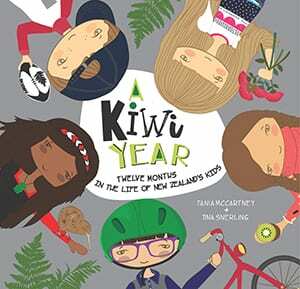 Tania McCartney is an award-winning author, illustrator, and book and magazine editor. The founder of Kids’ Book Review and the 52-Week Illustration Challenge, she is a long-time juvenile literacy ambassador, and a solid player in the Australian children’s book industry. 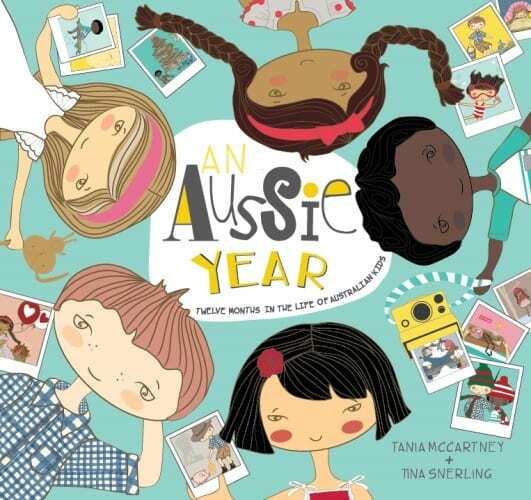 Her recent books include Australia: Illustrated and Smile Cry, a CBCA Notable Book for 2017. Tania lives in Canberra with her family, a forest of artwork and a mountain of books. Jess Racklyeft is a children’s book illustrator, card designer and watercolour aficionado who works from a studio located out the back of her house in Melbourne, Australia. Jess was selected for Luerzer’s Archive 200 Best Illustrators of the World 2013/2014. 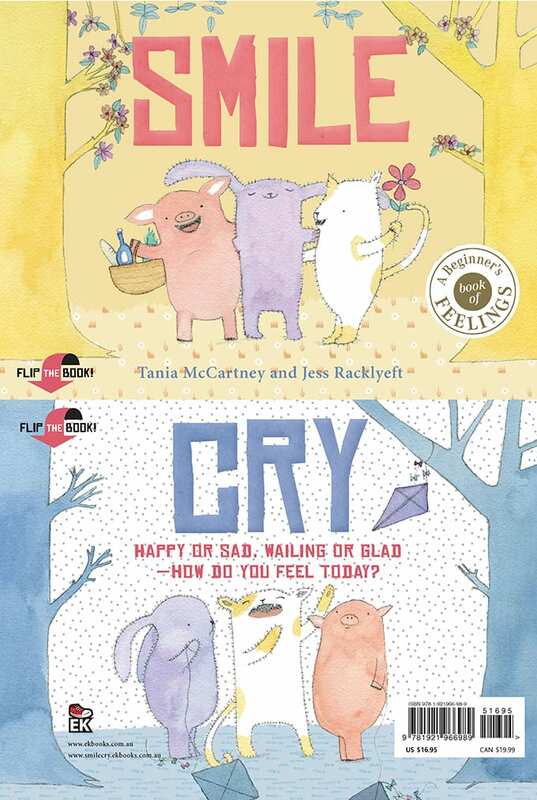 This innovative flip-format picture book is a sequel to the best-selling and CBCA Notable Book for 2017, Smile Cry. Piglet, Bunny and Cat return in a charming, whimsical sensory adventure that encourages kids to explore the multitude of ways that they can engage with the world around them, particularly via the senses of sight and sound. From watching ‘squiggly rain’ on a window to pointing out ‘heavenly horses’ in the clouds, from hearing ‘buzzing blossoms’ as bees collect pollen and nectar to ‘hot pan sizzles’ as a favourite meal is prepared, See Hear invites us to open our eyes and ears to the everyday magic that surrounds us. Younger kids will respond to the soft whimsical illustrations, while older readers will enjoy the onomatopoeic wordplay. Perfect for ages 3 and upwards, this is a book that will captivate children and parents alike. “The delicate, careful use of onomatopoeia is quite poetic. Fabulous phrases are given life via Jess Racklyeft’s absorbing illustrations..” Click here to read in full. “From the dream team that brought you Smile Cry (Crystal Kite Award 2017 and 2017 CBC Notable Book) comes another beautiful and whimsical book for little people. A sensory exploration of the world around us using the senses of sight and hearing is a perfect way to have children calm from their busy day.” Click here to read in full. 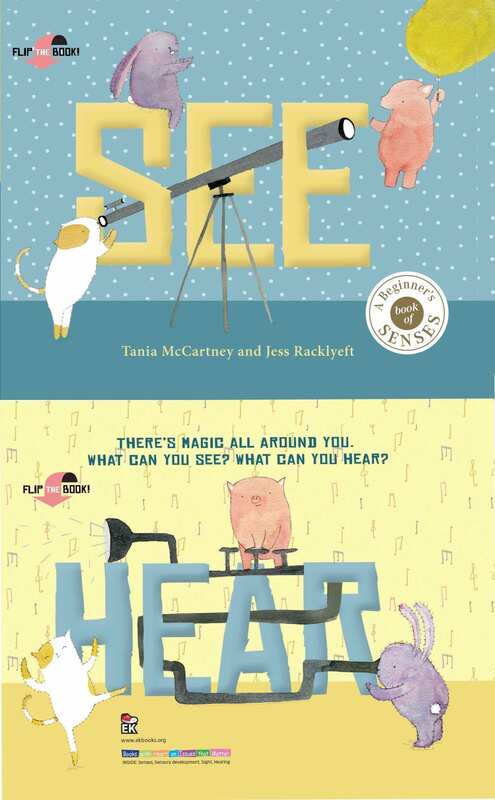 “This is a great beginner’s book about the senses.” Click here to read in full. “From watching ‘squiggly rain’ as it hits the window or hearing ‘buzzing blossoms’ as bees collect pollen and nectar I really enjoyed how this story explores all the little, everyday wonderful things around us (that maybe we take for granted). It was nice to talk about this with my kids and ask them things they hear, or see when they’re exploring their surroundings.“ Click here to read in full. 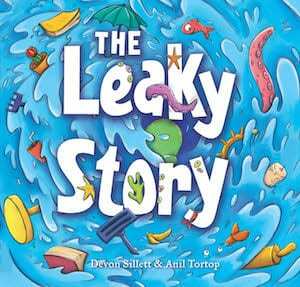 “the incredibly clever and innovative sequel to the award-winning picture book Smile Cry.” – Click here to read in full. “imagine how it could be used to encourage young writers to bring depth and richness to their words, to explore the world of metaphor and simile, to really look and listen and feel and taste and then share that with their readers. Start by having each contribute a new page for the book, making the common uncommon,; the stereotype original; the banal beautiful. Watch their writing grow! Such riches in an exquisite combination of author and illustrator that goes so far beyond the usual eyes see, ears hear books for this age group.” Click here to read in full. 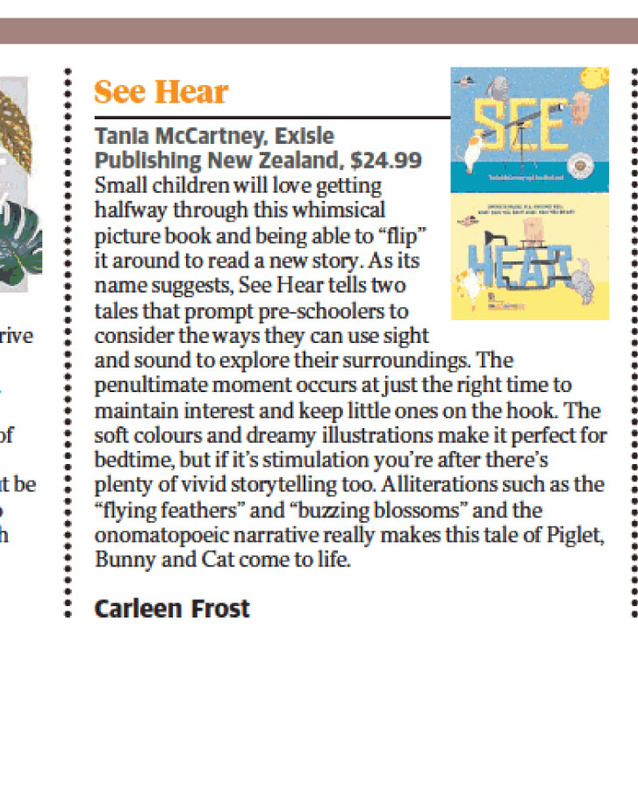 “…readers will get the most out of this book (a lovely list of sounds and sights, essentially) by using it as a starting point to explore the world around them, and more specifically, the endless ways and words that can be used to describe it.“ Click here to read in full. “…innovative flip-format book.“ Click here to read in full. Smile Cry: Happy or sad, wailing or glad  how do you feel today? A fun, flip-over picture book for children that reads from both front and back. 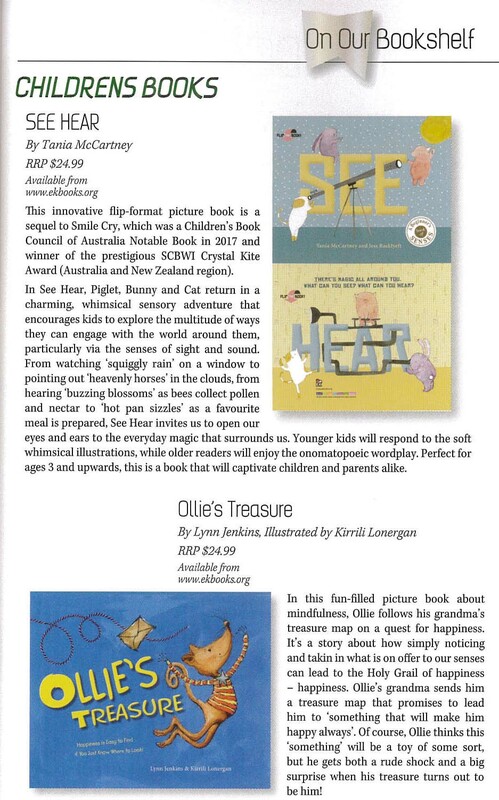 Smile Cry is an innovative picture book for young kids, showcasing the full emotional range of their formative years. Readers’ follow three adorable characters — piglet, bunny and cat — as they react emotionally to a variety of events and circumstances from everyday life. It’s the little things that touch the hearts of children the most, and Smile Cry typifies both the small joys and challenges that are the essence of childhood. The clever ‘flip book’ format means that the ‘Smile’ story reads from front to back, while the ‘Cry’ story reads from back to front, with both delicious narratives meeting in the middle. A heartfelt picture book that will be treasured for years, Smile Cry is perfect for ages 3 and upwards.